You know we Veggie Runners like to pack a good lunch box. You also know that we love a bit of beetroot, especially the roasted kind that is scientifically proven to make you run faster. Finally, you will be well aware that tasty, versatile dishes make us very happy indeed. This Vegan Roast Beetroot and Lentil Paté satisfies our desires on all counts. This stuff is, of course, brimming with goodness. From the good carbs and protein punch of the lentils through the B-vitamins hit of the nutritional yeast (perfect for vegans) to the joyous go-faster, taste-great thrill of the beetroot, this little pate has it all. It tastes great on bread, toast, crackers and the like. We’ve also discovered that the optional added chilli version is great with Mexican food too. Spread it on your burritos, baby, or use it as a side like refried beans. This paté’s delicious whatever way you play it. 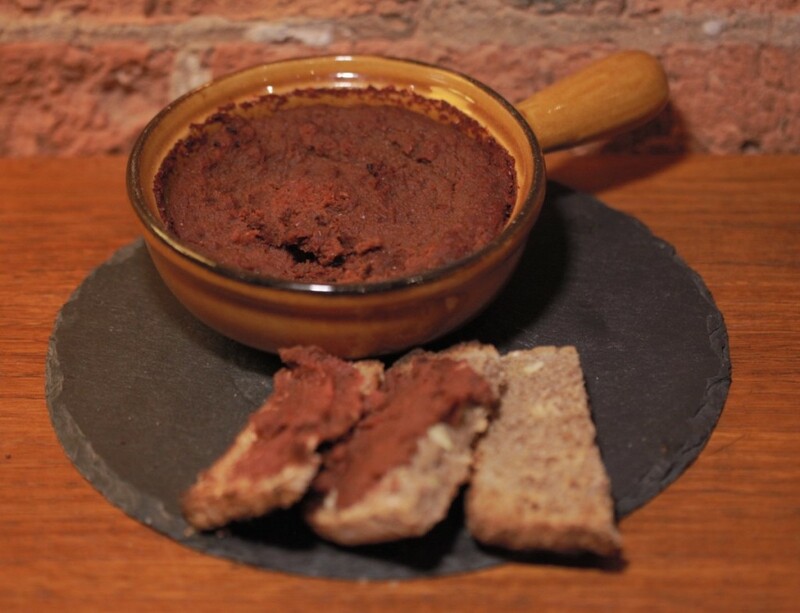 A tasty vegan pate made with roasted beetroot, lentils and herbs. It's great on crusty bread, toast, crackers, with Mexican food and even dolloped on jacket potatoes. Roughly slice the fennel and place in a baking tray with about a teaspoon of the olive oil. Peel the beetroot and roughly cut into chunks about 2cm square. Place on a separate baking tray and add 2 teaspoons olive oil. Crush the cloves of garlic with the blade of a knife and add to the tray with the garlic (don’t remove the papery skins). Pop both baking trays in the oven. Remove the fennel tray after about 20 minutes (the fennel should be soft). Remove the beetroot tray after 35-40 minutes when it’s easy to pierce with a sharp knife. In a food processor (or large bowl if you’re using a stick blender), place the fennel, beetroot, lentils, mushrooms, nutritional yeast, the marjoram or oregano and the chilli flakes (if using). Remove the cooked garlic from the papery skins (it should be lovely and squishy) and add that to the food processor too. Buzz the mixture until it’s well blended - you can leave some texture if you like, it doesn’t have to be baby-food smooth. Place in a shallow, ovenproof dish and cook for about 40 minutes, until the top if firm to the touch. Allow to cool and serve with bread, toast, oat cake or crackers.